Dental emergencies can happen at inconvenient times when regular dentists aren’t open. That’s why our referral network can have an appointment scheduled in Forest Hills, NY for you within 24 hours. Call 1 (347) 202-1143 and our friendly staff will be happy to schedule your emergency dental appointment within 24 hours. 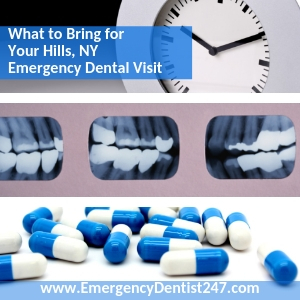 There are a few steps you can take to ensure your emergency dental appointment in Forest Hills, NY goes smoothly. First, gather any paperwork from a recent dental appointment. This can be anything such as x-rays or receipts of detailed dental care. Your emergency dentist will want to know more about your overall dental health. Next, call your emergency dentist office before your appointment to see if they accept your insurance. Even if you don’t have insurance, call to get an estimated cost of your appointment and work out any payment plans. You will also want to arrive at your appointment 15 minutes early. This allows time for you to complete any paperwork and ask any questions you may have. If you’re currently on any medications or have any allergies, you will want to let your emergency dentist know before your appointment begins. They won’t want to use anything that may cause you to have a reaction. Lastly, if you have any type of anxiety or fear of the dentist, let the emergency dental staff know. They are committed to creating positive dental experiences and will want you to be comfortable during your appointment. Emergency denture repair and replacement in Forest Hills, NY is now more convenient than ever with our services. OUr referral network offers same-day denture repair. Have new dentures fitted or your current dentures repaired all in a single appointment. If you’re stuck with the difficulty of a dental emergency, knowing about some common ones can help you work through yours. 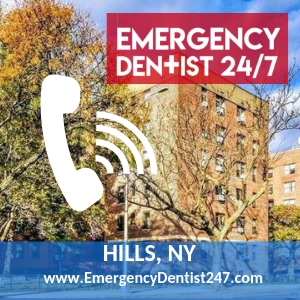 There are some things you can do to ensure the safety of your mouth until your emergency dental appointment in Forest Hills. If you’ve lost one of your adult teeth, your emergency dentist may be able to save it. However, it’s important you take a few steps in assuring that they will be able to do so. First, you should locate the lost tooth. Then, pick it up by the crown only. 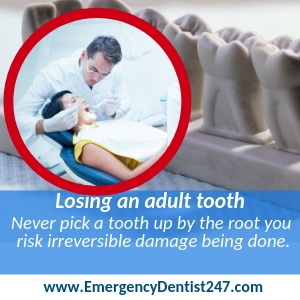 Never pick a tooth up by the root you risk irreversible damage being done. You can try putting the tooth back into its socket. This the best way to preserve it until your appointment. However, if that’s too difficult you can also put the tooth in a cup of milk or water. An oral infection, sometimes called a tooth abscess, is a serious dental emergency that should be dealt with as soon as possible. If you have a badly fractured tooth near the gum, an oral infection is going to thrive here. If you notice anything in your mouth that is similar to a pimple, call us immediately. This is one of the telling signs of an oral infection. If left untreated, a tooth abscess can cause more serious issues and put your life at risk. Losing a crown or filling can be stressful. It puts your open tooth at risk of being damaged by food and other debris. Before seeing a dentist, cover the tooth completely. This can be done with dental cement or gauze. You don’t want anything entering your open tooth. If damage is done before you can see a dentist, you may be at risk for an emergency tooth extraction. 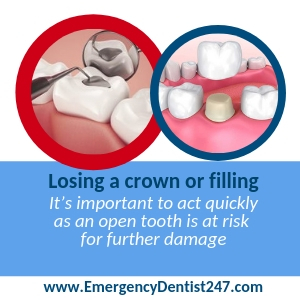 Your emergency dentist will do everything that can to not have to remove your tooth but for your safety, this may not be an option. If you need your tooth extracted, your dentist will begin by numbing your mouth. You won’t feel any pain just some slight pressure. They will then start rocking your tooth back and forth until the tooth slides out. Your emergency dentist may need to break the tooth into smaller pieces so the tooth comes out easier. After the tooth is removed, you will receive instructions from your emergency dentist. It’s important to follow these carefully as to avoid any issues with the healing time. It’s important you know whether you should visit an emergency room or an emergency dentist. An emergency room doctor will be best equipped to treat any head-trauma you’ve had. Be sure to prioritize any head trauma you’ve had before an oral injury. However, if most of your injuries or oral related, you should find an emergency dentist. They will be able to treat you quicker than an emergency room doctor. Have questions or want more information about the network? Please contact us.